Musical instruments are meant to be heard, but every once in awhile, the sound needs to be attenuated slightly. That’s where a mute will come into play. The mutes that come into the most frequent use are the mutes for stringed instruments and those used on brass instruments. 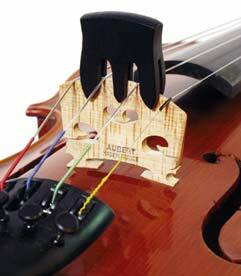 Here’s a picture of a violin mute. It’s usually just placed over the bridge, and it muffles the full sound of the instrument. The overall sound becomes quite a bit thinner. To give you the idea of a muted string sound, here is a passage from a string orchestra version of Verklärte Nacht (Transfigured Night), Op. 4 by Arnold Schönberg. The idea behind the work is quite unusual and you’re encouraged to look up the subject behind the music. The composer wrote the piece for six strings (two violins, two violas, two cellos), but this has been transcribed for a much larger ensemble. This entire passage is played with mutes and the resulting sound really has a night-time feel to it. Hearing this will give you a feeling for how mutes alter the sound. This is an entirely different matter from just telling the whole string orchestra to play softly.